Click the links below to check out a few of the previous True Blue stories and perhaps inspire your own story! Are you ready to meet the latest True Blue participant? “When did I become a Vancouver Canucks fan? I became a Canucks hockey fan at the age of six. My older cousins who were babysitting me at that time, were ALWAYS talking and watching the Canucks. Since that age, I have been into hockey at the Canucks and there was no looking back. Who is my all-time favourite Canuck (current/retired/no longer a Canuck)? I don’t really remember that far back BUT what I do remember is really liking Nazzy(Markus Naslund) and Ryan Kesler. My current favourite Canucks would have to be Zack Kassian and Alex Burrows. What is my all-time favourite Canucks moment? All-time favourite moment would have to be when Alex Burrows slayed the dragon. I was at THAT game in 2011…..and being that game it was definitely crazy from start to final buzzer and one very LOUD HAPPY arena. What is my favourite and least favourite part of hockey? My least favourite part about hockey is definitely shoot outs. I know that it’s very exciting to watch BUT it’s definitely not very fair that the game has to be decided that way. My favourite part about hockey is the excitement that it brings and how it brings the hockey community together. Do I have any game day/pre-game rituals? 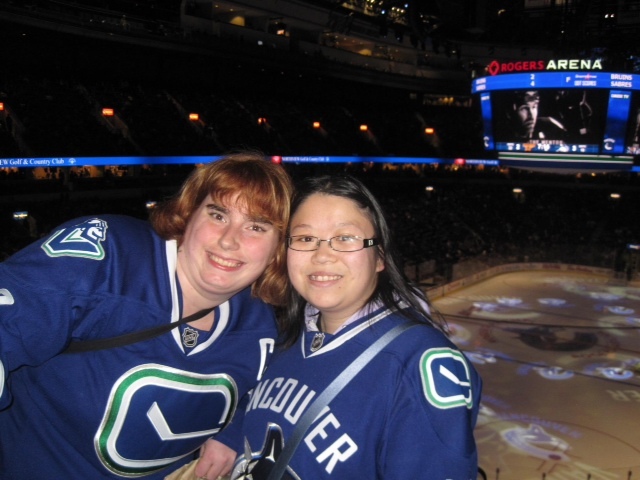 I just wear my Canucks gear during/on game days. Thank-you Artisia, for sharing your True Blue story! Burrows and THAT goal are definitely tops on my list of favourite Canuck moments (SO FAR) and I am beyond jealous that you were there at the arena for THAT epic moment. As loud as the the crowd seemed on TV and my neighbours and I were, I can only imagine what it must have felt like amongst the chaos and excitement in the arena. Each day takes us closer to the new NHL season and the first official puck drop of the 2014-2015 season. Before you know it, training camp will here quickly followed by the pre-season and suddenly we will be deep into the regular season arguing about which teams will and will not be playoff bound only to have a few surprises before all is said and done. This is a great series of articles Sarah. Well done. I have enjoyed everyone of them so far. I hope you have a few more up your sleeve.